When I was pregnant with my first child, I crocheted a baby blanket for her. It was a bit lopsided, made of fluffy blue yarn that felt like a cloud and I was very proud of it. However. I didn’t pick my yarn back up for about 10 years. During that time I had toddlers. Toddlers who would unravel anything I tried to make or find scissors and cut the yarn into bits. I was too busy chasing children to count stitches. Holding babies meant no time to hold a hook and yarn. But then, I made friends with knitters. 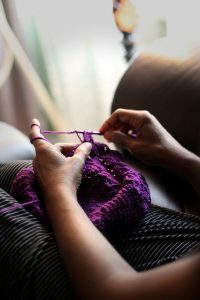 We started a once a week “moms’ night” to go out of the house and crochet or knit. Most of these moms also homeschooled. We would spend a couple of hours having a snack, creating things with our hands, and talking. The conversations drifted back and forth between us easily. We shared our challenges with our children and our lives with compassion and humor. This group helped my sanity like nothing else I had in my life. I needed it. We all understood the need to stop speaking mid-sentence to count stitches or to hold up our work and see how it was coming along. There were times we talked for hours and times we sat in silence, working on our meaningful projects in tandem. It felt good to be among adults. That year, I decided to crochet every family member a hat for Christmas. If my husband asked why I was abandoning him and our children again on a Friday night, I could just explain that I had to finish those hats and the children just wouldn’t let me work on them at home. I think I made a total of 5 hats that year. The hats were important but the camaraderie was necessary. For a few years, the only crocheting I did was at these once a week “Knit Nights”. And then one day, my babies were no longer babies. I could pull out yarn at home and no one cried for my attention. 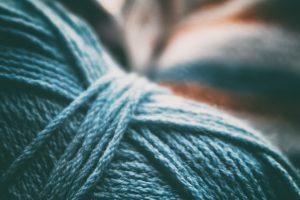 I taught my children to finger knit and to make things with yarn. My older two learned a bit and then walked away. My kindergartner, my baby, loved the act of creation with yarn and fingers and would sit by me and work her yarn as I worked mine. Two years later, she is still my little yarn buddy who now wants to learn to both knit (which I can barely do) and crochet. Now that no one needs to be held all day, I often find my hands free while I wait for my children. I crochet while I wait on them to work through a math problem. I crochet while they are in swimming class or gymnastics. I crochet while they play at the park. And I crochet while I watch Netflix with my teenager. At first, it felt a bit like wasting time when she asked me to watch shows with her that were purely entertaining, shows with no educational value. But then I realized my 13-year-old was asking her mother to sit with her, talk with her, be interested in what she was interested in. So, I got out my crochet project of the moment and sat by my daughter. I made a blanket in a simple repeating pattern that I could put down at the end of the show. 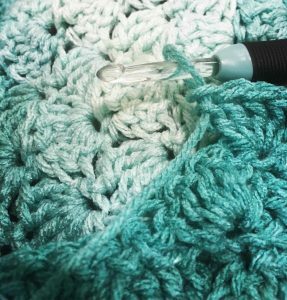 Without the crochet hook in my hand, it was easy to be distracted by thoughts of all the dishes and laundry I should be doing. But once I started working with my hands I could see that I was doing something and that let me relax and be in the moment. When my children were babies I knew how to sit for long periods and just hold them, because that was what they needed. Crochet has helped me to remember how to just sit and be with my children even if they aren’t in my arms anymore. And it has given me a creative outlet that I have realized I need. My yarn work is a product of myself, an art form that my children wear. That wasn’t what it started out as but it is what it has turned into. It lets me be a woman who creates things. I make gifts for friends and family. Baby blankets, wash clothes, hats, scarves, and sweaters. 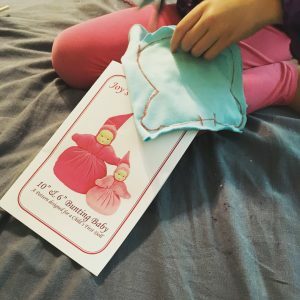 I am certain that if I were not crocheting, I would be knitting, or sewing or painting or coloring because I am not just a homeschool mom. 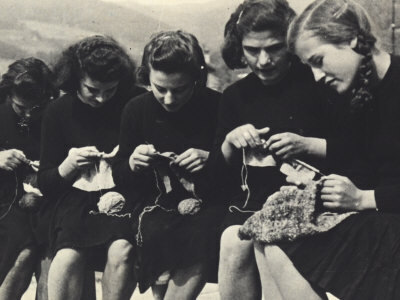 I still have Knit Nights with other homeschool moms. They bring their projects and their stories and we support each other through our craft projects and our lives. Previous: Previous post: Mom has ADHD! Oh My! Next: Next post: Magic Monday — Apples!